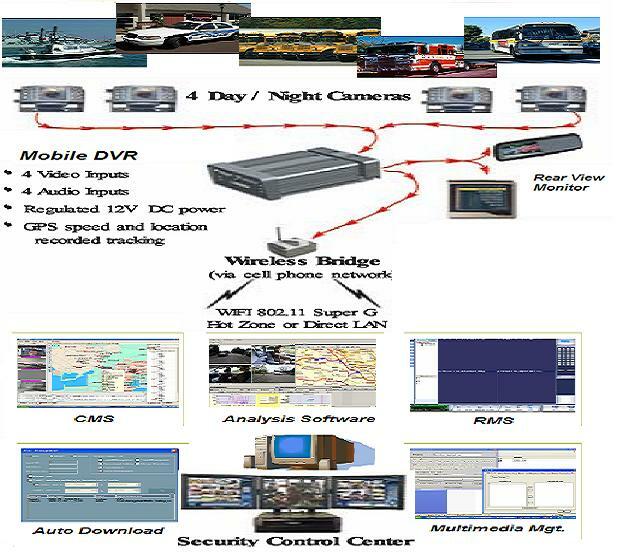 With an Off-line Analysis software, we can analyze full details of recorded video, vehicle tracking history, alarm event vs record time, and speed plot vs record time. With an SMS server, BlueMobile can broadcast instant emergency SMS message as well as individual vehicle message. MPEG 4 Encoder/decoder compression technology. High performance embedded real-time multitask operating system (RTOS). 4 to 8 ch real-time video/audio recording at 25/30 fps per channel supporting CIF, HD1 and 4CIF. Event Recording, Networking, and Video Display Features. Multi-layer user password and watermarking. Media Player such as Movie, advertisement and music. Optional active GPS Tracking and Location Verification Integrate. Optional WIFI and 3G Cellular Video Networking. Auto recorded images/files download program with uninterrupted resume download operation.